“I must go down to the sea again, to the lonely sea and sky and all I ask is a tall ship and a star to steer her by” wrote the poet John Masefield over a 100 years ago. 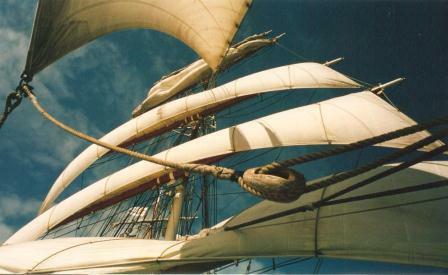 I was lucky enough to crew on the Stavros Niarchos once upon a time and it was magical, if hard work ! The first thing you are asked (gently encouraged) to do is go ‘up and over’ the rigging which is nerve wrecking the first time but you are doing it in your sleep (quite literally) by the end of the week. Because, while the ship is crewed by trainees on rotating watches you do have to be available to man the ‘bracing stations’, which can mean a sail change, so up you go. But it’s wicked exciting…….especially at night, when you are catching the tradewinds, under a sky full of stars with dolphins off the bow. There isn’t a sound (if you are doing if right) and all 1000 sq mtrs of sail are set right as you take your trick at the helm, master of the ship and as close as you will probably get to being master of the universe in your lifetime. Don’t ever hesitate if you get chance of going to sea.